Chennaiyin FC missed the chance to go top of the table as they drew 1-1 with Kerala at the Marina Arena. Another match with last minute antics saw the home side score in the 89th minute through a controversial Rene Mihelic penalty before CK Vineeth equalized for Kerala in the 94th . The result was fair to both sides given the balance of play. Chennaiyin came into the clash off the back of a hard fought away win at Bengaluru FC and the fatigue showed in their initial approach. While dominating the proceedings in the first half with 66% possession, the home side failed to create any worthwhile chances. Rene Meulensteen’s Kerala were happy to concede possession and defended well as a unit. The biggest chance of the half fell to Kerala’s Jackichand Singh who just missed the target following a speedy counter from Kerala. The first half, otherwise, was quite slow-paced and dominated by sideways passing. Chennai coach John Gregory stuck with the same impressive backline but freshened things up in midfield as Anirudh Thapa replaced a suspended Dhanpal Ganesh. The keepers of both sides were untroubled in a dull first half. Kerala weren’t particularly impressive but had a solid performance defensively. Captain Sandesh Jhingan was powerful and commanded his box exquisitely until the controversial penalty incident. 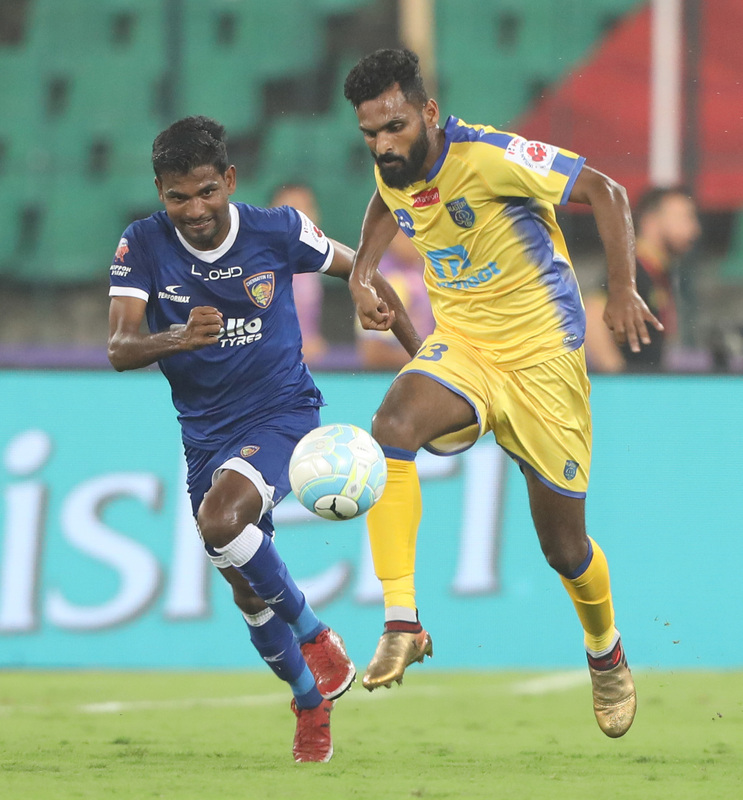 A shot fired towards goal struck the Kerala center half in the midriff but a penalty was harshly rewarded for handball and Jhingan yellow-carded. As Mihelic scored the spot-kick, it seemed like Chennai would take 3 points but Jhingan redeemed himself in the 94th minute, playing a fantastic ball across Chennai’s box for CK Vineeth to tap home and secure a draw. In attack, Kerala seemed more likely to score than their counterparts but were left ruing missed chances. Overall, Rene Meulensteen and his Kerala side will be satisfied with a draw away from home which was fair given the nature of the affair. Nemanja Lakic-Pesic and Jhingan have formed a solid partnership at the back, adequately supported by ex-United defender Wes Brown sitting in front of the defense. Kerala need to fine-tune their attack as their attack showed great potential especially on the counter. CK Vineeth was somewhat anonymous but showed his importance with an important goal. Courage Pekuson and Jackichand Singh also played their roles well, occupying dangerous positions in space between the lines and testing Chennai keeper Karanjit Singh. CFC are enjoying their best ever start to an ISL campaign and while it has been one of mostly positives until this juncture, there still remains a lot for them to work on and improve. The biggest priority for John Gregory should be developing a Plan B in attack. Currently, Chennai rely on a passing and low-crossing game in attack. The influence of Raphael Augusto in spreading passes to wide players is a feature for most CFC attacks, followed by low-crosses into the box for Jeje to try and convert. This proved ineffective against Kerala and CFC lacked a different approach as they looked for a goal. The absence of a target-man is a big-issue but unless CFC sign a striker of such a mould, Gregory needs to implement a different strategy when his side aren’t able to break opponents down. CFC especially missed Dhanpal Ganesh’s physicality in the center of the field with the matchwinner against BFC suspended. In his place Anirudh Thapa was handed a start and the 19-year-old had a good game with his driving runs from midfield. It’ll be interesting to see how Gregory rotates his midfielders with all of them putting in solid performances every game. A leaky defense is another issue CFC have faced in recent weeks. Usually solid and composed, the back-line has become vulnerable to a few moments of chaos and confusion every game which have inevitably led to late goals. Goalie Karanjit Singh was alert to keep CFC from conceding earlier in the game but Gregory needs to ensure his experienced defense can keep their focus for the entire duration of the game.